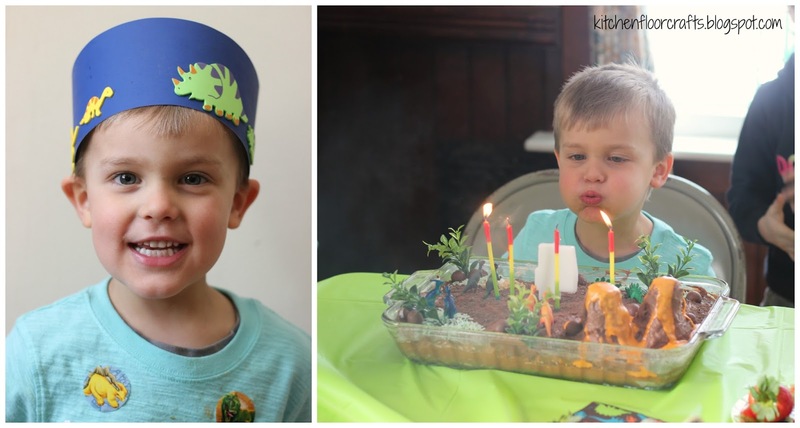 This month Little Brother turned 4, and if you've been reading with us for a while now you know that we love fun birthday themes over here at Kitchen Floor Crafts! 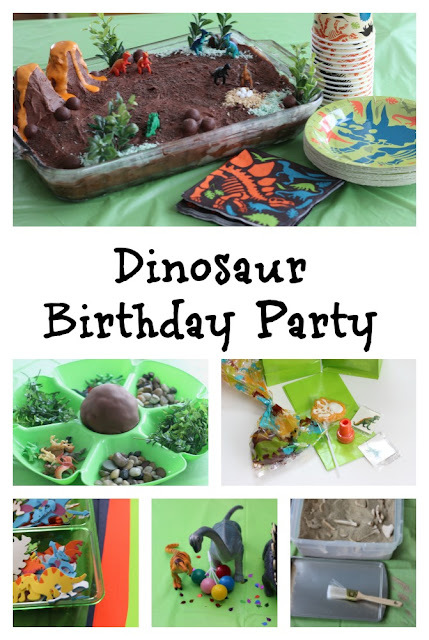 For this birthday we decided to go with a "Dinosaur Birthday Party" theme! For this post we were excited to team up with Oriental Trading Company to come up with some great favors, paper goods, and more! 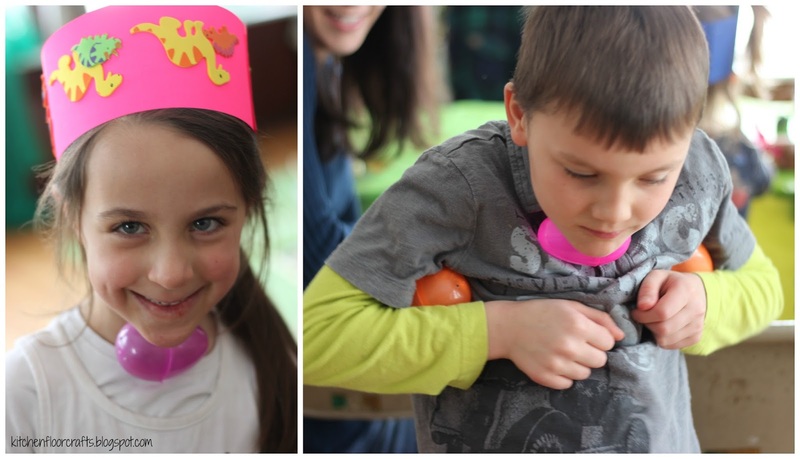 We also created some favorite old activities that fit perfectly this birthday party theme. To begin with, we created our invitation using Google Drawings and clip art from the internet. 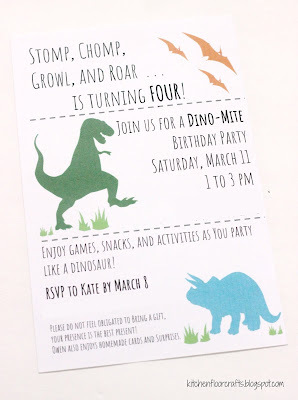 We got lots of wording inspiration from other fun birthday projects on the internet. 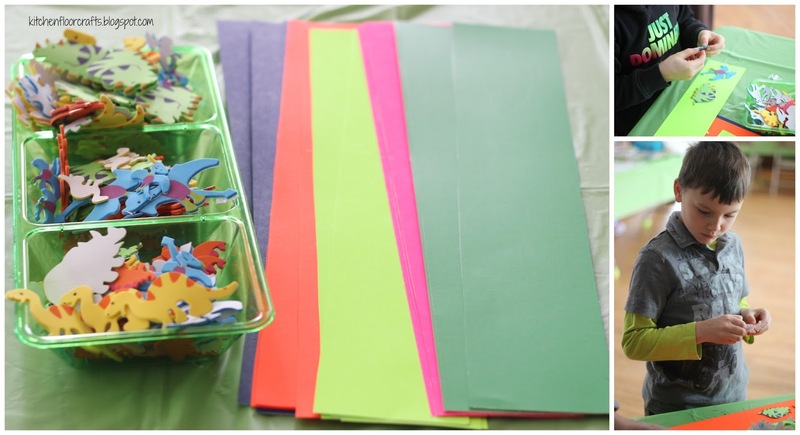 Using the great resources from the Oriental Trading Companies Party Supplies section we got organized with paper goods and party favors! We especially liked the "Dino Dig" party line! For this party I let Little Brother invite his entire preschool class, which meant I was expecting quite a few children. I needed lots of simple, easy to assemble party favors. 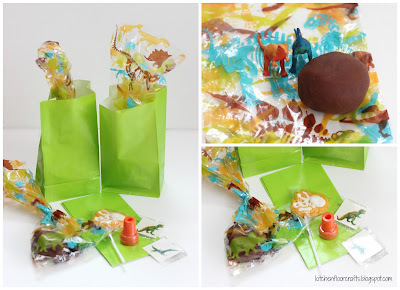 From Oriental Trading Company we used small green paper bags, dinosaur stampers, fossil lollipops, and dinosaur tattoos. We also made an extra batch of our chocolate cake playdough and gave each kiddo a small ball of the playdough and two small plastic dinosaurs (also from Oriental Trading Company.) The playdough and dinosaurs went into a plastic dinosaur baggies that had the Dino Dig pattern on them. I planned on keeping snacks simple, so I also kept the paper goods simple. I wanted lots of kid friendly, finger foods. We had a veggie platter, fruit platter, cheese & cracker platter, and some crunchy snacks. Kids could either drink lemonade, apple juice, or water. From Oriental trading company we used the Dino dig cups, cake size plates, and small napkins. The cake was lots of fun to put together! I made a vanilla sheet cake and decorated it with milk chocolate buttercream frosting. (I love this frosting recipe from Sally's Baking Addiction!) Afterwards I decorated the top to look like a dinosaur world. I sprinkled ground up chocolate graham crackers across the top. Using two ice cream cones I flipped them on to the top of the cake to look like volcanoes and frosted those as well. On top I drizzled a little orange frosting made from powdered sugar and milk. Plastic dinosaurs and plants decorated the top, as well as Whopper "boulders." 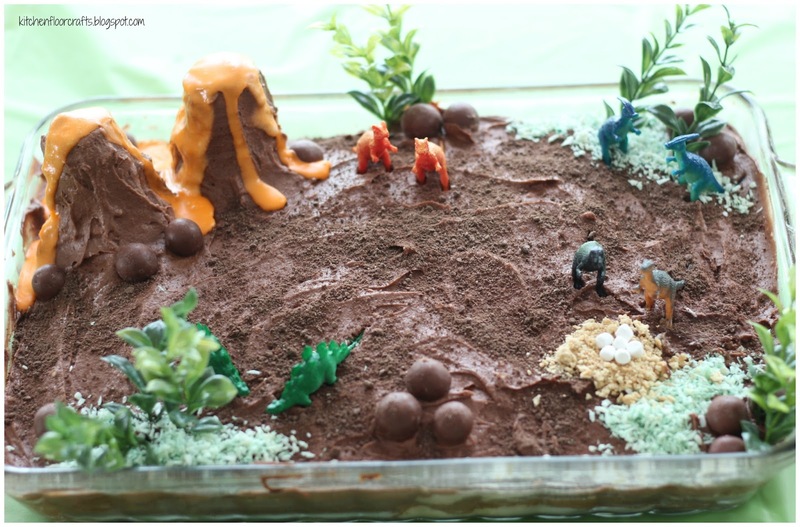 A small dinosaur egg nest was made using graham cracker crumbs and cocoa sized marshmallows. Coconut tinted green added a little more plant life to the dinosaur world. 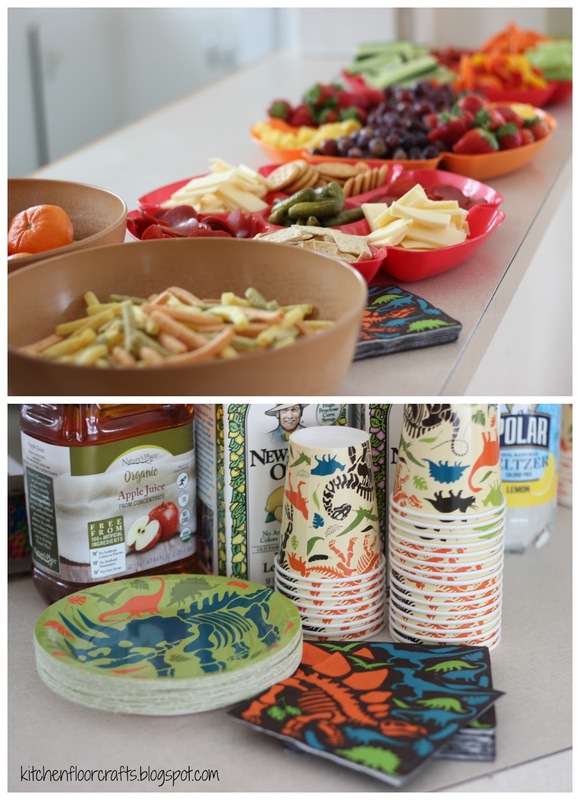 At our parties we often set up small stations of activities and crafts. For this party I set up one large craft table. 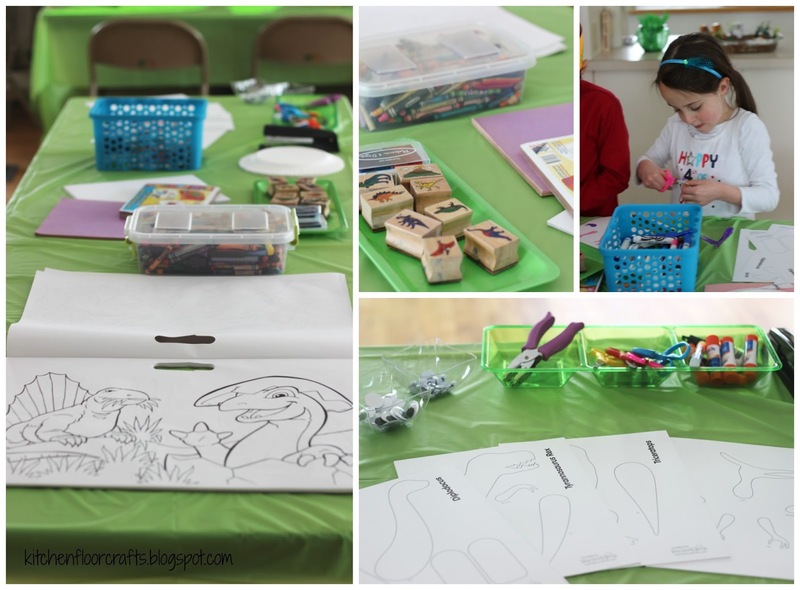 On the table there were dinosaur coloring pages, markers & crayons, dinosaur stamps, construction paper, and a dinosaur paper plate projects. I used these awesome printables from Learn with Play at Home. I also put out strips of brightly colored poster board and foam dinosaur stickers (also from Oriental Trading Company) so kiddos could create a dinosaur headband. 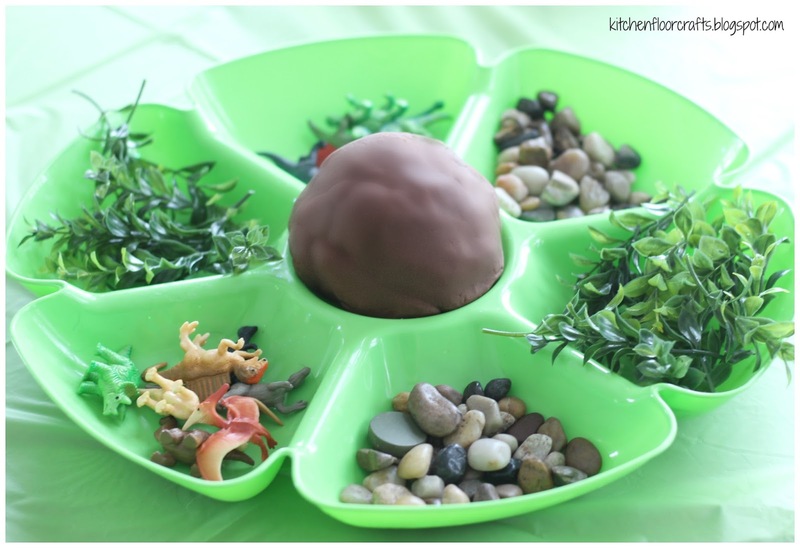 For some hands on fun, we set out a tray of our chocolate cake playdough with plastic dinosaur figures, plastic plant pieces, and floral rocks. Finally, we put out a fossil dino dig! 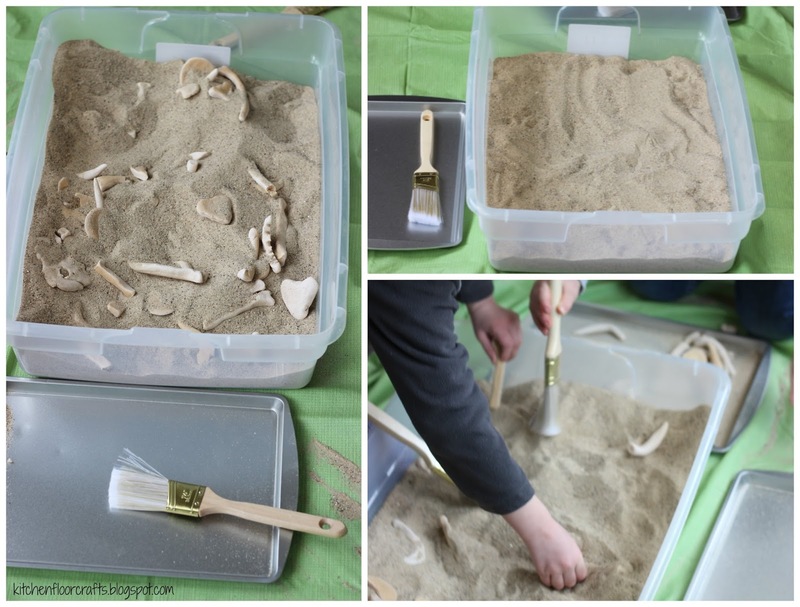 This activity did take a little prep work a few days ahead of the party, but we returned to one of our all time favorite activities - making fossils and dinosaur bones from salt dough! The boys and I made them several days ahead of the party. You can read about our process here. On the day of the party we added the bones to a bin of sand, and set out paint brushes for dusting on small cookie trays. Kids had fun digging them out, and then reburying them for the next people to play with it. Over the years we've collected quite a few dinosaur picture books, and we put out a basket of all the books. The kids loved this, especially when they needed a few moments to just stop and relax mid-party. Little Brother really wanted games, so we came up with a few dinosaur games to play. The first was a team game. The kiddos were given a large basket of plastic eggs - aka dinosaur eggs- and their task was to move all the eggs from one basket to another large basket across the room. But, since they were dinosaurs they couldn't use their hands to carry them! This one got pretty silly as kiddos carried the eggs under their necks, in their armpits, and between their knees! A second game we played was "Duck, Duck, Dinosaur!" We played it just like "Duck, Duck, Goose" but on the word "dinosaur" the tagged child became the t-rex and chased the other child around the circle. If they were tagged they became a dinosaur egg in the middle of the circle. Finally, to keep things festive, we played some of the PBS "Dinosaur Train" soundtrack and did a little dinosaur dance party! Of course, the ultimate test of a party's success is if the birthday kiddo themselves enjoyed it - and in this case I would say that was a definite YES! Happy Birthday to this sweet 4 year old of ours! 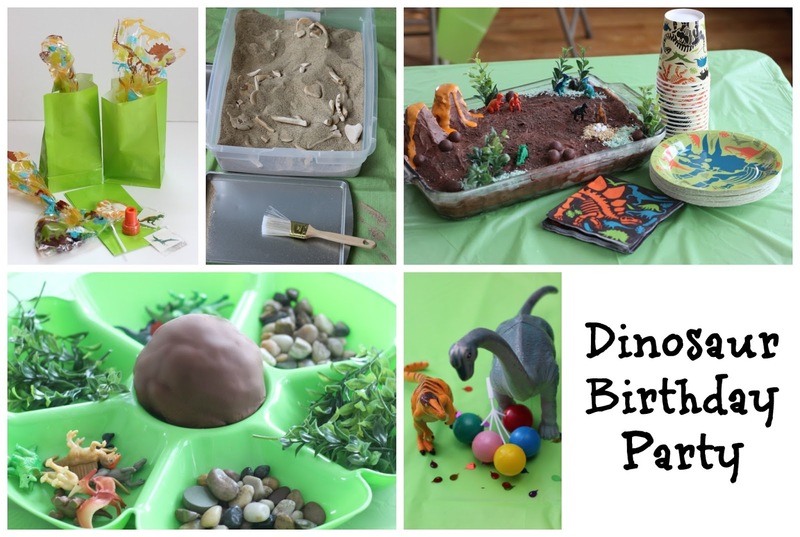 Don't forget to check out some of our other great dinosaur ideas on the blog!